Do you love bingo? Are you ready to experience one of the most exciting and newest bingo sites around? If so, you should give Reem Bingo a try. Reem Bingo offers a decent selection of games to choose from and will be sure to keep you entertained for hours. Reem Bingo is a new bingo site that debuted at the end of 2014. It is partnered with Cozy Games Bingo Management Limited; which just happens to be one of the leading game developers in the world. It features a large selection of new bingo games, top promotions and side games. In addition, you will be rewarded with five pounds immediately after sign up; no deposit bingo required. In this way, you are offered a risk-free shot to try out the site before spending any of your own money. You can play 30, 75, 80, and 90 ball speed bingo games on Reem. The choices are endless and the tickets start at just a penny each. There are free tournaments and guaranteed jackpots; the best one is available at the end of the month and carries a 1000 pound prize pot that is free to enter for VIPs. There are also a number of slot games for you to play. And if you want to gamble, there’s a great selection of scratch cards and casinos games to choose from. These offerings include old favourites, like the best Blackjack games and Roulette table games, to instant gambling like Cold Cash and Big Ben. In total, there are almost 40 high quality games to choose from. In addition, there are new games introduced every few weeks to keep the content fresh. Reem offers a huge selection of bonuses for April 2019 this is in addition to the no deposit bonus that will give you a chance to get your feet wet and to check out what the site is about. If you like what you see, and decide to give it a go, you will receive a staggering 500% bonus after you make your first deposit; one of the highest found on any bingo site. To qualify for this bonus, you must make a minimum deposit of 5 pounds; unlike the competition that requires a deposit of at least ten pounds. There are also excellent daily promotions and fantastic monthly and seasonal promotions available. They are always changing these promotions, so it’s important to check often to see what is new. Also, it is important to note that, all bonuses are subject to the wagering requirements which are allowed on games. Although it is part of a network, Reem’s black and gold layout is a refreshing change from other sites and navigation is easy. In addition, Reem takes the security of its players seriously so they utilize the most innovative encryption software to keep your information safe. In addition, if you ever need assistance, customer service is available to serve you. Reem’s other top priority is fair gaming; all of the games on the site a determined by random number generators. That is to say, the games are not rigged to payout at specific times and each player has a fair chance of winning. In addition, the random number generator is certified by eCOGRA and tested by iTech labs. 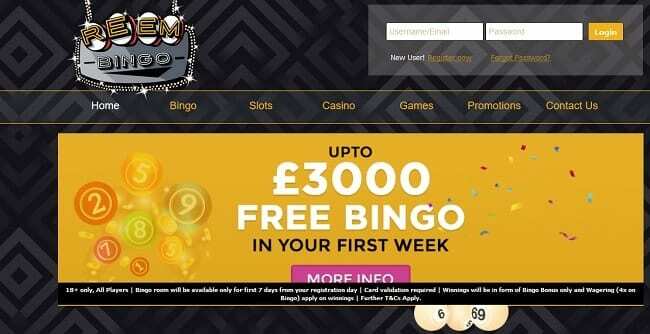 The site is completely responsive and offers full mobile compatibility for bingo. In other words, it works fantastically on iOS and Android mobile devices.